← Monsters appear in Amsterdam window! Since I started working on my next Draw It! book I’ve been finding out even more wonderful and strange things about London, and meeting people who have specialist jobs here, for mini-interviews to be included in the book. I’ve chatted to the Ravenmaster at the Tower of London, talked to a firefighter called Louisa who’d just saved someone’s life, and been on patrol with the river police on the Thames. 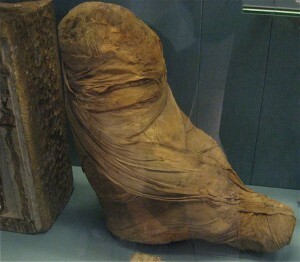 Yesterday I visited the British Museum to find out something about mummified animals. There are plenty of human mummies on display, twenty four at the moment, but there are also wrapped animals, including cats and even a tiny fish. The ancient Egyptians were very keen on mummifying cats as offerings to their goddess Bastet. Room 62 also had more mysterious wrapped objects. Apparently temple visitors chose a ready-wrapped cat, paid a priest for it and hoped the goddess would appreciate their offering, but maybe it was a sacred gift-shop scam as X-rays show there’s not always a whole animal in these mummies, sometimes just a a couple of bones or even a piece of wood. I was lucky enough to talk to John T, assistant keeper of the Egyptology department, who kindly let me see one of the BM’s temperature-controlled storage rooms, where rows of mummies rested on racks, exuding a strong scent of resin and spices from their ancient wrappings. A beautiful curly wig made from glossy human hair rested on a stand in a glass case. This entry was posted in Books, Drawings, Sketchbooks, Work in progress and tagged Ancient Egypt, Bloomsbury Activity books, British Museum, Draw It!, Draw It! 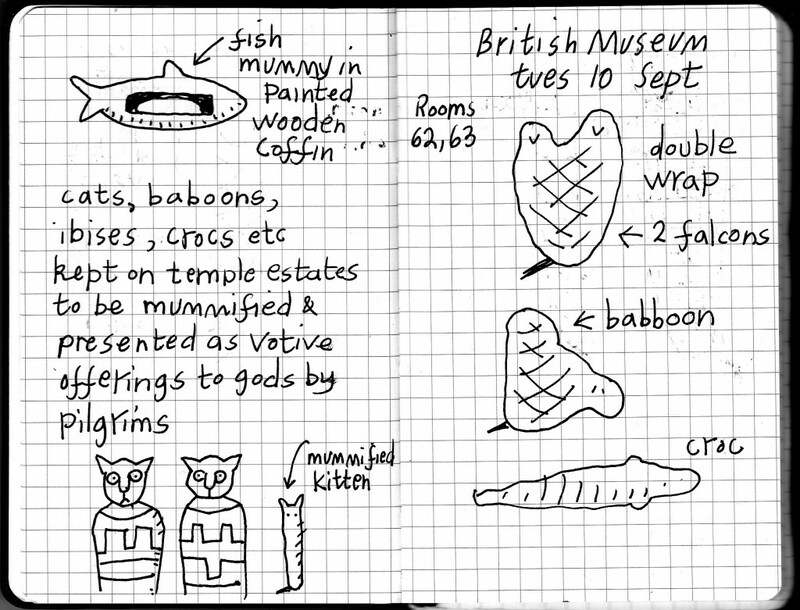 London, interviews, London, mummies, museums, notebooks. Bookmark the permalink.